We all want to know: What kind of trouble can you get into if you’re caught? There have been Mile High Club stories for as long as there have been airplanes — or at least, it feels that way. With so much information circulating the internet on “how to” join, it's obvious people are intrigued by the Mile High Club, even if they have yet to join. But what are the rules on airlines? How much trouble could you get in? While it might sound fun and exciting, no one wants to get arrested for getting busy on a plane. When it comes to repercussions for joining the club, reports are thoroughly mixed. Just this past March, two strangers met on a Virgin Atlantic flight, only to hook up in the bathroom mid-air. The couple later got into a squabble back in their seats. Upon arrival in their destination, the female passenger was detained for behaving, “in an abusive and threatening manner which severely disrupted the flight." 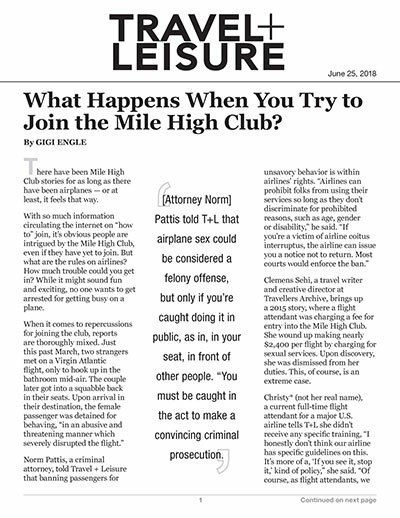 Clemens Sehi, a travel writer and creative director at Travellers Archive, brings up a 2015 story, where a flight attendant was charging a fee for entry into the Mile High Club. She wound up making nearly $2,400 per flight by charging for sexual services. Upon discovery, she was dismissed from her duties. This, of course, is an extreme case. Brian Palmer addressed these issues in 2011 Slate article: “Apparently the issue isn't directly addressed in flight attendant school, but attendants generally ‘knock, inquire politely, and barge in if necessary.’” Certainly to some passengers, this sort of light acknowledgement almost feels like an invitation to press your luck. Here is the bottom line: When it comes to the Mile High Club, if you’re doing it in the bathroom, you likely can’t get in any serious trouble. You could be banned from the airline, maybe, but even that is pretty unlikely. T+L reached out to Lufthansa for comment, but received no reply. As far as we can gather from recent news stories, small bathrooms are not going to stop people from trying. If you’re looking to get busy on an airplane, do it in the bathroom and prepare yourself for possible embarrassment (and a strained back).